Phone operating systems are also referred to as “Mobile OS”, the operating system operates Smartphones, PDA, and other mobile devices. Now the modern best phone operating system combines the features of a personal computer OS with other special features includes a Wi-Fi, GPRS mobile navigation, camera feature, touch screen speech recognition, and some other features. Before this smartphone world, the mobile phones are used to make and receive calls only add occasionally uses to send text messages. Now in modern smartphones are designed closer to handheld computers that helped to send emails, play games, watch the news, movies, can help to make video calls and so many special features are included. Operating systems are using in computers and laptops to manage their resources and memory to do multitasking in one place. As same, the modern smartphones are designed with special Phone Operating Systems with special and advanced functioning. This is so simple if you have already bought your new smartphone, click the name and version of the software in the settings menu. If you buy a new smartphone, you can check the OS and its version on the handsets specifications information. Most of the operating systems are open source software. Open source means, there are no restrictions to download this, if you are a developer, you can develop software or applications by using this open source code. Simply these are customizable. This is the List of Smartphone Operating Systems in 2016. 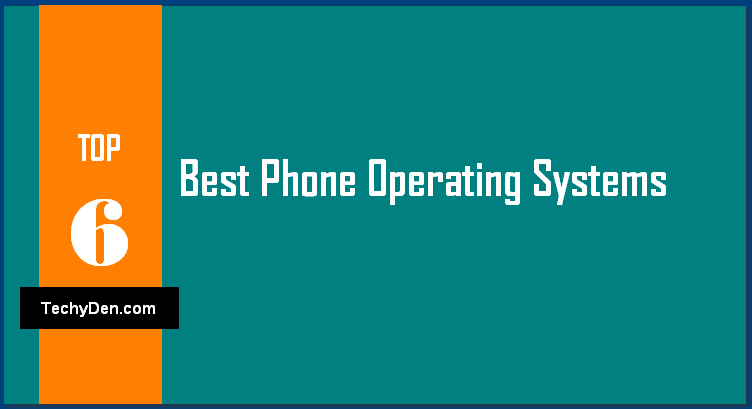 Here I am including the some of the best List of Operating Systems (phone operating systems). Android Phone Operating system is developed by Google and powered by the Linux Kernel. The Android OS was released on 20th September 2008 by the name of “Astro”. After few upgrades of this versions, they released the names “Bender” and “Cupcake”. Android Phone Operating system is the most leading platform in the smartphone market. After entered Android Operating System in smartphone and tablets market, the android gained excellent popularity due to beautiful appearance and efficient working. Another thing is, it introducing more features in their every update. Google Play is the place to download millions of apps to enjoy the functionality of Android. This is one of the Best Operating System for Smartphones. Some android operating system smartphones are HTC wildfire, Samsung Galaxy Gio, Motorola Droid Razr, Samsung Galaxy S3, HTC Desire etc. iOS is developed by Apple Inc. This is the second largest phone operating system. This is closed source platform. The apple products – iPhone, iPod touch and iPad and second-generation Apple TV is also running with this iOS. The iOS is derived from Mac OS X. iOS was introduced on 29th June 2007. Since iOS has many upgrades and currently the latest one is the iOS 6. The iOS developers mainly concentrated on performance rather than appearance. But the iOS was not supported any third party applications, until the release of iOS 2 on July 11th, 2008. “Jailbreaking” method allowed installing third-party applications still now. No doubt, this one of the best-operating systems in the world. iOS has been used in iPhone, iPhone 2G, iPhone 3G, iPhone 4, 4S, 5, 5S, 5C. Windows phone Operating System is the third largest installed base OS after android and iOS. Windows phone OS was developed by Microsoft. All of the PC users have maximum experience with Microsoft windows operating system. On Feb 15th, 2010, Microsoft unveiled the next generation mobile OS – windows Phone. This OS included metro design language, one drive and Office (Microsoft services) and other Microsoft feature integration like Xbox music, Xbox video, Xbox live games and Bing included. Some Non-Microsoft serviced such as Facebook and Google accounts are also included in this Windows OS. The windows phone devices are made Nokia, HTC, and Samsung. Nokia Lumia series completely windows based some of the mobiles are Nokia Lumia 800, Nokia Lumia 900, Samsung Focus and HTC Titan 2. Blackberry phone operating system is developed by Blackberry limited. This is powered by Quantum system software (later renamed as QNX software systems). The blackberry smartphone OS is the closed source operating system like iOS and Windows OS. This is mostly used by Government employees. This is a next-generation platform for blackberry smartphones and tablets. There are two major releases of blackberry OS from QNX software systems – Blackberry tablet OS with blackberry Playback and blackberry Tablet OS. Firefox phone Operating system is an open source OS and uses Mozilla public licenses with Linux kernel based smartphones and tablet computers. This OS developed by Mozilla, which is a non-profit organization. Firefox web browser is the most successful open source software from Mozilla. Best Browser in 2016: Which One have The Most Users And Why? Sailfish phone Operating System is developed by Jolla. Jolla is an independent designer and developer of mobile devices. After failing in Nokia in 2011 with their previous OS “MeeGo”, they started and established a new company in the name of Jolla Ltd. This OS is a partly open source and adopts GPL (General Public License). Sailfish is used in the Jolla Smartphone and also in the upcoming Jolla Tablets. The OS is developed by Linux kernel. The OS is developed by Linux kernel. The OS includes a multitasking graphical shell (lipstick). The sailfish OS first released on 27th November 2013. This month 19th December 2014 sailfish OS 1.1.1.27 version was released. The second version may be released in May 2015. Among the all above best Phone operating systems, Android is the most popular Phone operating systems and sthe econd biggest tech company Operating system is Apple’s iOS. Satish Kumar Ithamsetty very informative article i have come to know three new OS.